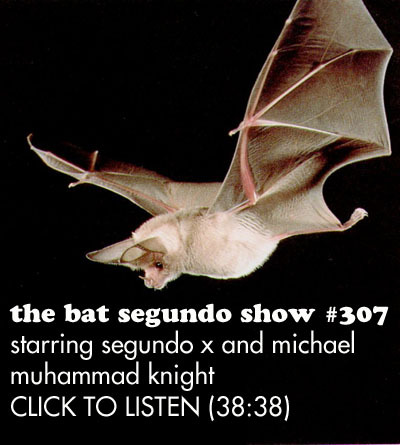 Michael Muhammad Knight appeared on The Bat Segundo Show #307. Michael Muhammad Knight is most recently the author of Impossible Man and Osama Van Halen. Condition of Mr. Segundo: Expressing forceful words about his distinct identity. Subjects Discussed: Knight’s powers of prescience, Muslim punk, fictional suicide as a form of personal critique, the fictional character Mike Knight vs. the real Mike Knight, the Amazing Ayyub, character creation as the author arguing with himself, spiritual poles and quasi-Mikes talking with Mike creations, romanticizing the failure to be an adult, the mythology of consolation, leading a life in peripatetic homelessness, being a provocateur, compromise vs. getting into certain quarters, reading Will & Ariel Durant’s big red books at an early age, God as the Force (Star Wars) vs. God as the Dao, the Asma Gull Hasan defamation suit, Edward Norton’s soliloquy in The People vs. Larry Flynt, the coercive nature of apologies, getting kicked out of ISNA press conferences, journalism and formality, being disheartened by the Sunnis, whether or not umma is impossible, respecting religious difference, noting laundry lists of possession, constant reference to Spike Lee’s Malcolm X over The Autobiography, women-led prayer and Islam, disowning whiteness, Pakistan as a white supremacist country, elaborating on Knight’s remarks to David Hunter concerning cyphers, filtering information from the outside world, the apostasy essay, following up on Mark Athitakis’s remarks on allegorical house layout, and the last time Knight was in touch with his father. Correspondent: I want to start off with something that you have a particular talent for in your fiction — and that is the anticipation of events. The Taqwacores, of course, most famously initiated the Taqwacore punk movement. But as I learned in the afterword of Osama Van Halen, you write about Muzammil Hassan, arrested for beheading his wife on British TV. And you are unnerved by the fact that you were not only not able to foresee it, yet it happened. What do you attribute this prescience to? I’m curious. Knight: I don’t know. It spooks me out a little bit. You know, I wrote this fictional decapitation of myself in the parking lot of a TV station in Buffalo. Having a Muslim TV station in Buffalo and then, in real life, there was a Muslim TV station in Buffalo. And an actual decapitation happened there. Just as this book was about to come out. And that started to spook me out a little bit. Knight: I’m starting to get afraid right now. Correspondent: Well, this is interesting. Because as I read your two memoirs — both Blue-Eyed Devil and Impossible Man — I saw, for example, that the Victoria’s Secret catalog actually came from a personal example. Correspondent: As did the Penguin misspelling of the Qur’an. And I’m curious as to whether this almost convenient lifting of events from your own life is what leads to this prescience. Have you ever thought about this? Knight: I don’t know. But it’s all starting to blend together. Because I was on the set of the Taqwacores movie, when they were shooting that in the fall. And one day, I showed up on the set and I saw Dominic Rains, who was playing Jehangir, in a drum circle with Marwan from the real life band Al-Thawra in the parking lot of this house. The driveway. And you had the real life Taqwacore punks and the film Taqwacore punks. The fiction and the reality, all the borders are gone. Correspondent: But drawing from events so explicitly, what do you do to invent? To draw the distinction between something that is personally experienced versus what you concoct? Such as the idea of a Muslim punk scene. Knight: I don’t know, man. Because in Osama Van Halen, I have a fictional character. So sometimes I’m writing from the omniscient narrator. Sometimes I’m writing myself. Like the real-life author. First person narrative. Sometimes I’m talking about this fictional Mike Knight. And it’s almost like there’s no distinctions anymore. I mean, I just wrote myself getting my head chopped off. And now I’m afraid that’s going to happen. Correspondent: I’m wondering if this is more of a metaphorical losing your head. Because after you wrote The Taqwacores, I know that you were considering leaving Islam altogether. And you were urged back into it when you realized there was some fluidity. And so I’m curious as to whether this was finally cutting the cord to a particular type of Mike Knight or…. Knight: Well, there were some serious things I was trying to talk about in that story. You know, Imam Ali said to hate in yourself what you’re going to hate in other people. So the way that I made my points was to just look at myself in the worst way and to see myself as the object of critique. Everything that I was lashing out against I could search into myself and find some trace of that. That’s why at the end, I deserved to have my head chopped off.